Solutions for every labeling requirement. Revolutionary new professional industrial labeling machines and heat shrink tube printers all use the same industrial supply cartridges. 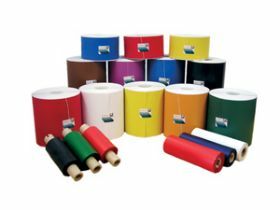 The LABELShopÂ® supply offers the most extensive line of labeling tapes, wire wraps and heat shrink tube materials in the industry to meet demanding industrial applications. FOB Shipping Point. K-SUN LABELSHOP® TAPE CARTRIDGES 26'L. Product No. Size & Color wt (lbs.) Price Ea. Other tape sizes and colors available. Contact dealer for details. Product No. Size & Color wt (lbs.) Wt. (lbs.) Price Ea.